The Myanmar VISA application can begin and be collected on the same day. At its simplest, turn up early-ish to the Embassy of Myanmar in Bangkok with your passport and payment. The rest needed for the application can be put together while queuing and will hopefully help your brain from dying in the process. While the application is simple the queuing can be tedious and of course sweaty. My recent application saw queues out the door, lining the walls of the Myanmar Embassy. We join the line at roughly 9.30 only to finish at 12.30 (returning 15.30 for collection). Inside the Myanmar VISA application offices the queues snake round the room, one queue for foreigners, a second for Thai. Note the Thai line goes a whole lot quicker. For foreigners you will first need to queue to be put into another queue; we arrive to the front desk only to be handed a number token for a final wait, thankfully in seats, for our number to be announced on loud speaker. 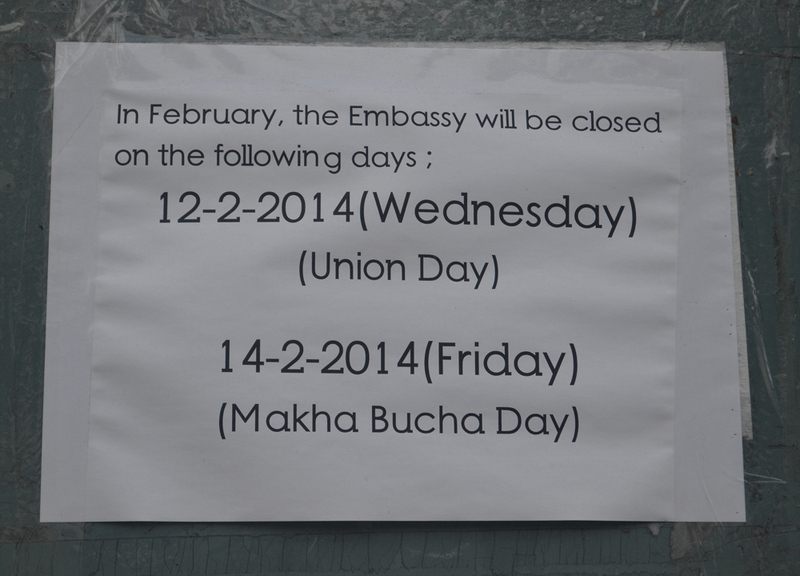 Read below for prices, opening hours, necessary documents and directions to the Embassy of Myanmar. (Note I got a second Myanmar Visa in Bangkok during April 2013, arrived 08.00 and was out before 09.30). Note, the Embassy is located in the Surasak Area of Bangkok. 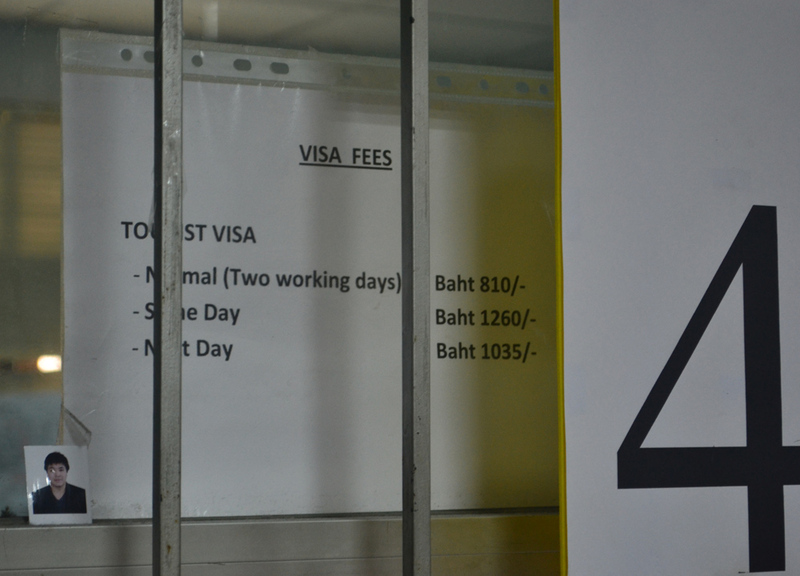 Current prices (Mar 2014) for the Myanmar VISA application in Bangkok are 810 Baht (2 working days return) – 1,035 (next day return) – 1,260 (same day return) all for tourist VISA. The Myanmar VISA Application in Bangkok opens 09.00am and closes 12.00pm – Monday to Friday. Application offices open again at 15:30 closing at 16:30 for VISA collection. Note, these are the times which the doors will stay open, you may be waiting inside for longer hours. For collection you will be given a slip showing pickup window number, again split into two queues for Foreigners and local Thai. Full opening hours shown in image below. Also be aware the VISA application is closed on public holidays. I turned up on Union Day (like an idiot) to be greeted with the sign below. Most important documents are the passport and payment as the rest are available outside the Myanmar VISA Application Office. 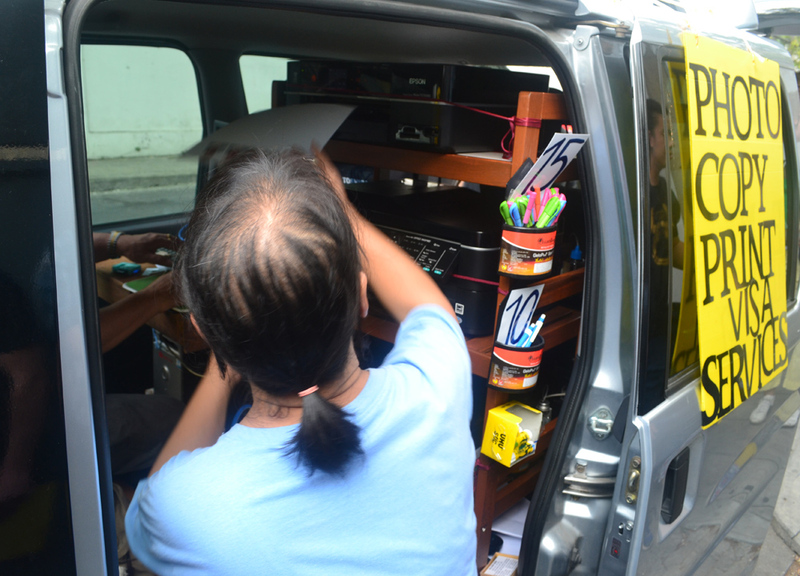 Here you will find a small minivan setup to help with the process. Free application form, passport photocopy (3 Baht), 2 x passport photos (150 Baht for four). You may also need print of hotel bookings and flight booking for the same day return (proof of urgency). They also have computers and internet available to download anything forgotten. The Myanmar VISA application office is found at the corner of ‘Thanon Pan’ arriving from ‘Sathorn Road’. Google map it if travelling by taxi. However travelling at peak period the Skytrain is the better route. For skytrain; travel to Surasak Station (Silom line), exit at Exit 3 and walk with the traffic on the left side of the street. Thanon Pan will be the 2nd street on the left. The Myanmar Embassy is on the opposite corner and is hard to miss. To make it simple I photographed the Surasak Station map (below) and put a big red dot for the Embassy.